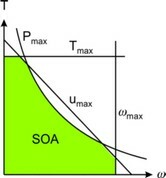 If the limits are plotted in the torque speed plot, an Area of Safe Operation is found. 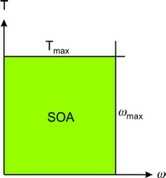 For a proper motor, the torque speed curve of the load should be inside the Safe Operating Area (SOA). The figures below show the safe operating areas for the various motor types. Brush DC-motors (left figure) have a safe operating area that is more limited than Brushless DC motors and AC synchronous motor (right figure). In practice motor suppliers of Brushless DC motors and AC synchronous motors may impose limits on the maximum voltage and power. This is mostly done to prevent heating up the motor too quickly during continuous operation, or material limits. This makes the Safe Operating Area of these motors look like that of a DC motor. Compared to DC motors, Brushless DC motors and AC synchronous motors will always allow higher torques and speeds because of the absence of mechanical commutation.